Technology fuses with circus to bring this exciting new show Undertone to Wonderland Festival at Brisbane Powerhouse this November. In this bold new work Undertone is reinventing a number of traditional circus disciplines. Presenting dangerous stunts in sleek new choreographic clothing. It has a vibrant, urban, feel to it that produces a range of spectacular, and sometimes hilarious, scenes. 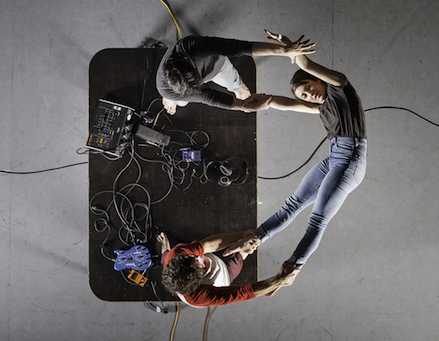 Undertone uses live triggering to create soundscapes from the performance itself. Incredibly Undertone has an interactive process that produces a unique performance every show. Undertone’s circus performers have a combined performance experience of over 60 years. Previous credits include some of the world’s most highly regarded companies including; Circus Oz, Stalker, Strange Fruit, Palazzo, GOP, Moscow State Circus, Patch Adams, and the BBC. Under the direction of chronic innovator Avan Whaite, this wealth of experience is channeled in new directions creating moments that are unexpected yet assured. In Brisbane the cast will team up with electronic music guru Zoltan Fecso, who uses new audio technologies to create interactive scenes that integrate the performers and environment into the music. This is a merging of bodies and brainwaves. Fresh from its premiere season, which earned a spate of good reviews, as well as taking out the coveted ‘best circus’ award at Perth Fringeworld, Undertone is poised to ‘wow’ Brisbane audiences.